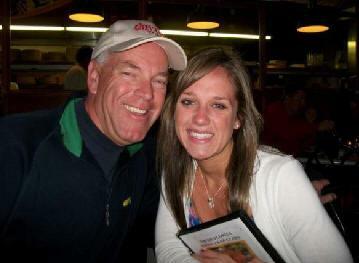 April 17, 2010 - On April 1, 2010, at 12:53 PM, a Beech B36TC Bonanza aircraft, N4BA, piloted by Tom Hausfeld, 50, of Springboro a private pilot, and his daughter Kacie, 21 were killed during an in-flight collision with terrain and post impact fire at the Dayton-Wright Brothers Airport (MGY), Dayton, Ohio. The intended destination was DuPage Airport (DPA), West Chicago, Illinois. The personal flight was being conducted under 14 Code of Federal Regulations Part 91 on an instrument flight rules (IFR) flight plan. Visual meteorological conditions prevailed. At 12:51 PM, the pilot contacted Dayton Approach Control. He informed the controller that they were airborne and climbing through 1,300 feet mean sea level (msl). About 1252, the pilot stated that he needed to return to the airport because a “compartment” had come open. The controller acknowledged and cleared the flight to return to MGY. Shortly afterward, the pilot stated that he had an engine failure and was declaring an emergency. Radar data depicted the airplane tracking the Runway 20 extended centerline after takeoff. The initial radar data point was recorded at 1251:05 (hhmm:ss) and indicated that the airplane was near the departure end of Runway 20 at 1,300 feet MSL. About 1251:42, the airplane entered a right turn and remained in that turn until the final data point, which was recorded at 1252:46. At that time, the airplane was approximately 1/2 mile southwest of Runway 2 at 1,200 feet MSL, and on an approximate magnetic course of 094 degrees. Witnesses reported observing the airplane approach from the west with the landing gear in the retracted position. They stated that the airplane banked to the left in an apparent attempt to line-up with the runway. The left wingtip struck the ground and the airplane impacted an open grass area south of the runway. A post impact fire ensued. Initial ground impact was on the airport property about 860 feet south of the Runway 2 threshold. The debris path was oriented on an approximate 024-degree magnetic bearing. The main airplane wreckage, which consisted of the fuselage, engine, empennage, and wings, came to rest about 179 feet from the initial impact point. 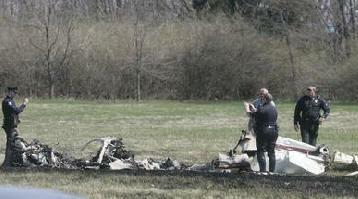 ‎The left wing tip separated from the wing and came to rest about 75 feet south of the main wreckage. The propeller separated from the engine and was located along the debris path, about 124 feet south-southwest of the main wreckage. Weather conditions recorded by the MGY Automated Surface Observing System (ASOS) at 1253 were: Clear skies; winds from 210 degrees at 9 knots, gusting to 22 knots; and 10 miles visibility.